April 10, 2017|Posted in: Holidays and Seasons, Let's Eat! 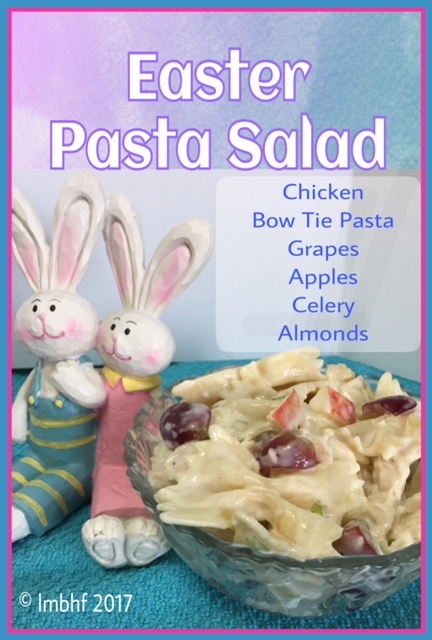 This delicious pasta salad is an Easter tradition in our family. It’s one of the things we look forward to every Spring. It’s savory and sweet at the same time. While it would be delicious anytime, Easter is a perfect time to add it to the menu. We often pair it with BBQ chicken and rolls. Yumm! Make some for your family this Easter!! Mix together the first nine ingredients and refridgerate 30 minutes to 1 hr. Add grapes, celery, pineapple, apples and almonds. 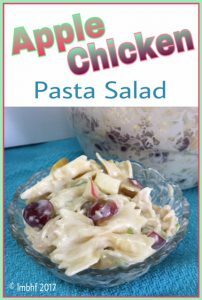 chicken pasta salad with apples is yummy. Thanks for linking up with #BloggingGrandmothersLinkParty. This looks yummy Lori. Good summer salad. Thank you for linking up at the #BloggingGrandmothersLinkParty. I have shared on social media. This recipe makes me think of a summer brunch. TYFS with #BloggingGrandmothersLinkParty. It is my pleasure to co-host with you. « Easter Books for Kids!